"The obscure we eventually see. The completely obvious takes longer." The outer circle of the fresco depicts Minerva, goddess of wisdom and the arts of civilization, Neptune, god of the sea, Mercury, god of commerce, Vulcan, god of the forge, and Ceres, the goddess of agriculture, instructing America's founders in knowledge to create a great new nation. The above fresco adorns the Capital Dome, center and heart of our nation's government. Contrary to what American schoolchildren learn in school, the Puritans did not come to America in search of freedom to worship. They came in search of a place where they could force their worship on others. Back home in Europe, they were constantly frustrated in their attempts to force everyone ELSE to worship as they did. For hundreds of years, they'd battled the Catholic Church for supremacy, with mixed results, much bloodshed and sorrow, but no permanent victories. So, they set sail for the New World with the intention of establishing a religious dictatorship. Although they were just one of many groups to settle in the New World, due to the ferocity of their religious conviction and their willingness to commit atrocities in pursuit of their fanatic cause, they did tend to dominate things for awhile. For the first 100 years they occupied their little corner of New England, the Puritans terrorized, murdered and oppressed with brutality born of self-rightuous zeal, and an intensity bordering on madness. It was this legacy of intolerance and religious oppression that inspired the Founding Fathers to do everything possible to ensure that the new nation born in 1776 would never again know such horrors. America's founders did not need to look to Europe for reasons to separate church and state -- all the evidence they needed was right there, in the colonies. The Puritans had proven beyond doubt that no civilized nation could afford to allow religion and government to mix. The Founders wanted to ensure that scenes all too common in Puritan America, such as the public hanging of a woman in Boston who was seen crossing herself and saying the rosary, would have no place in our great new nation. Separation of church and state was intended to protect against religious zealotry, and to protect the nation's citizens from each other. Religious freedom ensured that you could worship (or not) as you saw fit, and it protected you from bullying neighbors who believed themselves qualified to interpret God's word and enforce "His" laws. Regardless of whatever term the Founding Fathers may have used to describe themselves, they were not Christians the way today's evangelicals define the term. Most were Deists. They had Faith, but they were not slaves to Belief. Most were too enlightened and too well-educated to perceive the Christian Bible as a book to be taken literally. "Meat for men, milk for babes" was an expression used to explain how different levels of mentality perceived the Bible. For grown-up minds, the Bible contained allegories that shed philosophical light on spiritual matters. More childlike and uneducated minds might mistake the stories in the Bible (regardless of how often they contradicted each other) as literal history -- but you will not find such infantile minds among the Founding Fathers. See, for example, The Jefferson Bible, a much-shortened version created by rural farmer Thomas Jefferson and preferred by many of his generation and beyond. The Jefferson Bible was edited down by eliminating the vast majority of the standard (King James) text, which Jefferson identified as "the work of inferior minds." Separating "genuine Jesus" from the rest of the bible was not difficult, per Thomas Jefferson in a letter he wrote to James Madison, "It is as easy as plucking diamonds from a dung-hill." While the Founding Fathers acknowledged the existence of people with minds so unsophisticated that they would believe the Bible to be literally true, the FF did not believe such people to be capable of self-government. To the Founding Fathers, the business of governing the nation belonged to the adult-minded. Madison and Jefferson were particularly eloquent on this topic and left more than enough literary evidence to prove beyond doubt that whatever else America may have been at its birth, it was NOT a "Christian nation." It was not accidental that so many references to Greek, Roman and other deities abound in the art and architecture of that era. "Meat for men, milk for babes" applied to all aspects of human philosophy and spirituality, not just the Bible or any other religious text. 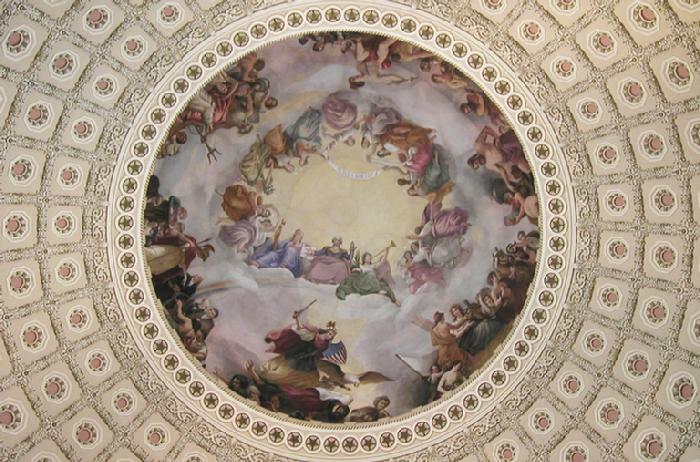 The ceiling of the Rotunda, heart and soul of our nation's government, is not adorned with Roman gods and goddesses because the Founders believed in or worshipped those pagan deities. The point was, the IDEALS and CONCEPTS that those Roman deities represented. Names, costumes, fanciful representations of winged angels or chariots drawn by mythical creatures... That was just the art in which ideas were clothed. The Founders were big on ideas. They were, as their own legacy of writings attests, intellectual giants, compared to the ignorant, uneducated and feeble minds who today claim to want to "return to the Constitution." From the sublime (the lofty ideals of the Founders), we have descended to the ridiculous (the ignorant bias of the so-called Tea Party). But that does not mean to say that the Founders did not have their own Religious Right to deal with. They did. Then, as now, religious fanatics sought to force others to conform to their own belief system. Such ignorant and intolerant people have always been with us, and probably always will. 250 years ago, the Founding Fathers established a Constitution and Government intended to protect us from Religious Right of the 1700's. Today, we need to continue the fight for freedom by resisting the Religious Right of the new millenium. The Religious Right has never been, and will never be, either spiritual or correct. The Religious Right does not represent America's true Rural Values.